Circuit training utilizes a technique of high intensity with a low rest interval to provide a result of increasing both muscular strength and endurance. While circuit training has proven to be effective, prolonged circuit training can produce overtraining and chronic fatigue injuries. Circuit training is best utilized in initial strength building at the beginning of an off-season workout program, according to fitness expert Charles Poliquin in "Football: Five Steps to Increase the Effectiveness of Your Strength Training Program." The push press trains both hip drive and the press, making it more ideal than the bench press alone for football training. This exercise needs to be performed in a weight rack to decrease the risk of the athletes. Begin by holding the bar on the chest with a shoulder width grip. Use a slight leg push and large arm drive to push the bar and lock the bar out overhead. Your coach should make sure that the athlete keeps his back flat and does not lean backward during the arm drive. 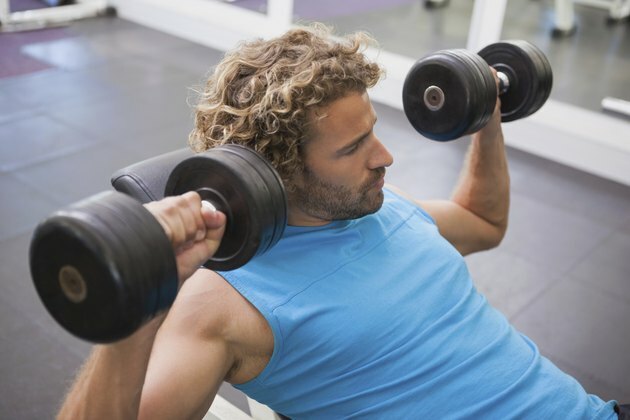 Hammer curls provide a highly explosive repetitive curling exercise. Use a dumbbell in each hand -- curl the first dumbbell all the way to the chest. As the dumbbell begins down, begin curling the other dumbbell. This will continue repetitively, using the curling and relaxation as a counterbalance, to prevent bouncing during the exercise. Power shrugs are important in developing shoulders, hips and quadriceps, all of which are important to tackling and blocking. Begin by gripping the bar, hands shoulder width apart. Keep your arms fully extended throughout the exercise. Bend the legs and explode back to standing. Using the momentum of the hip drive, shrug the bar by trying to pinch your shoulders to your ears. Hold for a one-count at the highest point of the exercise and then proceed back to the resting position. Split squat lunges are effective for increasing leg drive power used by football players for improving speed. There is two distinct ways for performing this exercise, one using dumbbells and the other using a barbell on the back as if performing a back squat. Using dumbbells is easier for circuit training for players switching between stations. Stand with both dumbbells in your hands. Step out into a lunge, making sure to keep your knee over the front leg. Proceed down until your back knee is just off the ground. Push yourself up and back into the beginning position -- alternate legs and continue repetitively. There are many different circuit exercises of which can be utilized for football training. The key is to have exercises that do not place the athlete at risk from a fatigue injury and train players for the game of football. Exercises should also be easily able to switch between partners and groups to minimize time lost in transition. Other weight exercises include but are not limited to leg press, leg extension, leg curls, upright rows, hammer rows, pull downs, toe raises, bench press and military press. Other body weight or alternative exercises include but are not limited to jump rope, body weight squats, dips, push-ups, sit-ups, crunches, jumping jacks and wall sits.